Daphne Guinness has given me a new-found respect for style. She owns the concept of style. Fashion is art, but style is a masterpiece. Daphne Guinness created masterpieces by putting together ensembles that defy logic. Yes, the designers create the clothing, but it takes a special individual to bring those pieces to life. I respect the risks Daphne has taken with her style. She made every piece look good. When I look at Lady Gaga and Nicki Minaj, I think they’re fashionable, but they’re lacking style. You know you have style when you jump so far off the deep end, no one tries to save you, but they jump with you. 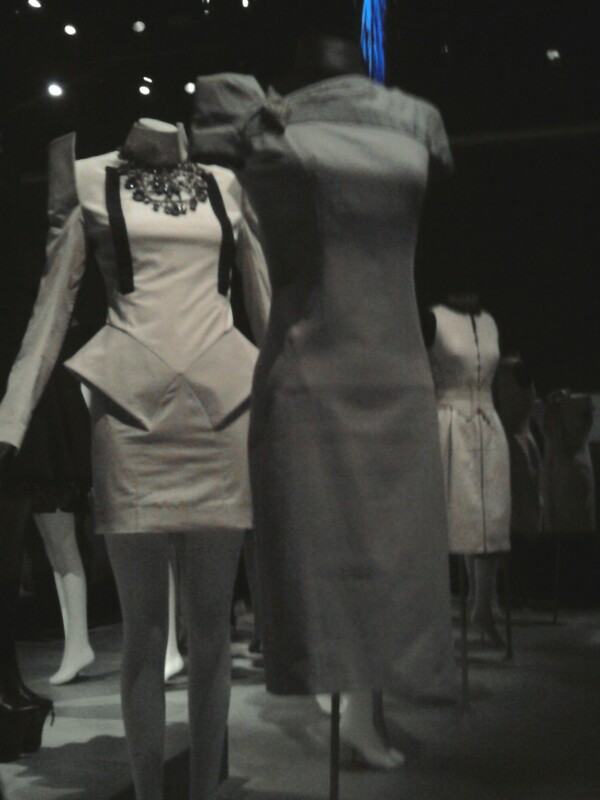 Many of the pieces I saw in the exhibit are pieces I would wear. Too many people are fascinated with labels and not the actual heart and thought that go into styling. The collection is amazing. What stood out to me the most in the exhibit is the headwear and jewelry, which little to no credit is given in the exhibit. The necklaces and brooches are so beautiful. The way they sparkled under the lighting made my heart beat in Rhapsody. I had a rare moment where I felt like I saw an angel. Experiencing the exhibit was one of the most beautiful things I’ve gone through in this life. I especially love Daphne’s black silk, velvet and cord military style jacket; Gareth Pugh’s black and white cotton dress; Alexander McQueen’s off white silk chiffon empire style dress; Pierre Balmain’s black sequence dress; Massaro’s Navy satin and rhinestones heelless platform shoes; Noritaka Tatehana’s heelless platforms with red crystals and gold metal studs; and Rodarte’s fingerless leather gloves with spikes. I love all the tuxedo jackets in the exhibit. I also notice how heavily inspired Beyonce is by Daphne Guinness’s style because a lot of the pieces in the exhibit were worn by Beyoncé in her music videos. I’m sure Daphne has inspired many.